I visited a couple of years ago. What is it that you like to do? What is your budget? How much time will you be in AK? It is a huge state and it takes time to get from A to B. Will you drive from Illinois to AK or fly in? I have some great road trips for you in between Illinois and AK if that's the case. We drove from South Florida to AK and back. We did a lot of things in between as well, but we took a month to do it. Anyways, back to AK. We took a summer dog sled ride and stayed in Seward for a bit. Stayed a few days exploring Denali / McKinley. Hiked to Glaciers. Did a lot of scenic drives. Spent time in the Klondike and in Chicken, Alaska. We wanted to Fish and/or hunt but never did. I'll save that for next time. FWIW, Hunting and Fishing licenses (and guides) are expensive for us non-AK-residents. Some types of hunting or certain places require you to have a guide, so make sure you know the regs beforehand. You will have a hard time finding a highway from Anchorage/Fairbanks to Juneau. At one point a not for free Ferry ride is required. And going in and out of Canada along that road is too. We didn't make it to Juneau so I don't know how the border crossings go for that route. But you can bring your car all the way to Juneau. It's a long drive from Fairbanks or Anchorage to Haines or Skagway which are the closet Ferry points to Juneau - or at least I think they are, since they both get you to Juneau fairly quick and were the cheapest tickets I could find. Anyways, it takes a couple of days out of your trip in driving/ferry time. Everyone talks about how pretty the Ferry rides are, so that in and of itself is something "to do". There are trains, planes, local cruises as well as ones from Seattle, hiking (skiing in the winter), Glaciers to hike to or see from the water, wildlife all over. You have Mt. McKinley / Denali - this can be a train ride or stop for you. Camping of course. This should get you started... And I am sure the local AK residents will chime in too. Just providing my visitor perspective on your question. The best way to see a lot of Alaska is to fly into Anchorage and rent a car. You can drive to Fairbanks, and spend time in Denali National Park along the way. 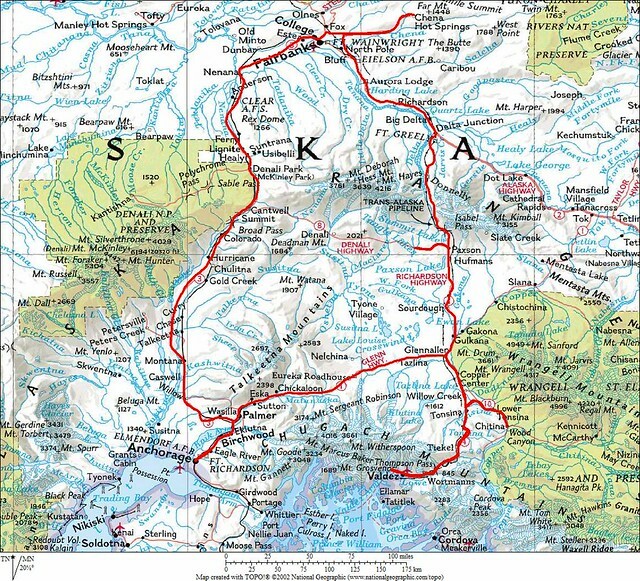 South of Anchorage is Whittier, Portage, Girdwood, and Seward which are all great destinations. Juneau is in Southeast Alaska. If you want to drive there, it'll involve going through Canada and taking a ferry ride. Or you can fly there on Alaska Airlines. The Indianapolis and Fort Wayne Intrl Airports are closes so if i flew I'd do it from there, the O'Hare airport in Chicago is just a nightmare! I definitely do want to visit a lot of the nature side, I'd forgotten about Mt. McKinley! I do want to see what the urban area has to offer at some point too, I'm guessing most of that would probably be in Anchorage though. I also want to see places like Nome and places really far north but the people I'm going with is refusing to go anywhere that has no roads in or out of it like that after seeing those Hollywood movies about them recently. I'm not sure if I'll have a passport to go to Canada, so I don't think I'll be able to drive to Juneau if i go there either. I do definitely want to go driving around though, i know that AK is over half the size of the entire mainland US so there is definitely lots to see. The people I'm going with all love railroads though so im sure we'll be on that at some point. I'm not sure how long exactly at this point, it will probably be later this year. That Denali National Park definitely looks good! DO NOT try to hit Anchorage, Fairbanks, and Juneau in one trip! Unless you're here for more than a month..
First off, fly into Anchorage and rent a car. You can do some stuff from the train that runs between Seward, through Anchorage and Denali Park to Fairbanks, but a car allows far more freedom, and is highly recommended. That's a little under 1000 miles on the road, with lots of convenient activities along the way. That's a bit more than 1000 miles in your car. 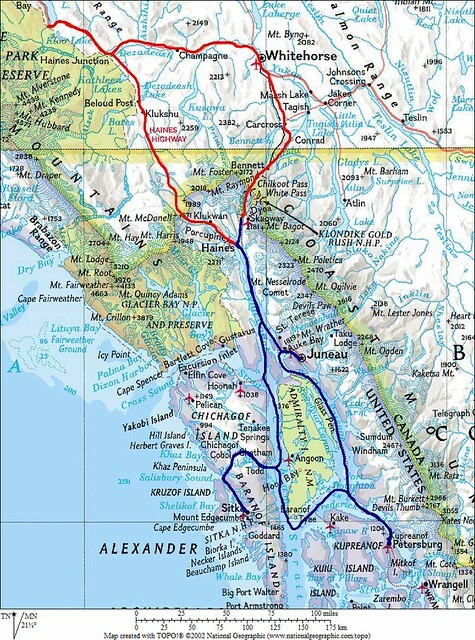 Activities are more spread out and generally take longer (such as bus tours of Denali and Wrangell St. Elias National Parks). About 600 miles by ferry, and a little over 400 in a rental car. You need to cross over into Canada for the car portion. Quite a few activities, lots of variety. You haven't said anything about the length of your trip, your budget, or who you're going with (besides that they get confused between movies and reality), and hardly anything about what you want to do. That makes it hard to give good guidance, though Heathen and Daxter have you some good ideas. For a two week trip for average folks who want a little outdoorsy stuff, I'd go from Anchorage down to the Kenai, visit Seward and/or Homer and maybe do some guided fishing, then go to Denali for a little hiking and a bus ride through the park. Talkeetna is a cool town as well and worth a day or so. If you have the money do a flightseeing trip there. Rent either a car or an rv (only if you really think you can drive it somewhere near the speed limit on bumpy, often windy roads). 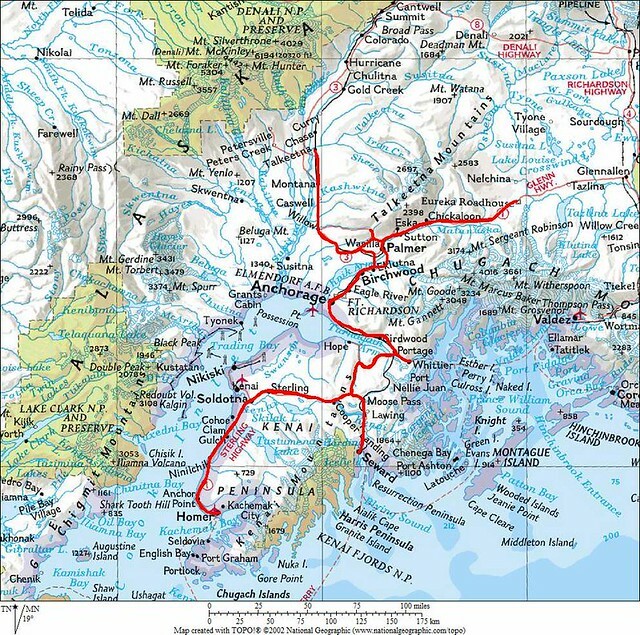 You can take the train to either Seward or Denali if you really want to. Definitely do more research on these areas. There's plenty of information out there. Ohh one other thing to the OP. You mentioned a couple of airports. Chicago O'nightmare er. O'Hare has a nonstop flights to Anchorage. There is a good possibility that Ft. Wayne does not, which means you could end up flying back to O'hare or if anything you will have a layover somewhere else. I looked hard for South Florida to Anchorage direct flights and I guess it is just too far or not enough of a demand, since I can't find any. I've visited in 3/11, 2/12 and 1/13 and stayed at a place north of Fairbanks to watch the Aurora. Started in Anchorage (flew), took the train to Fairbanks (3rd time took the train southbound at the end of the trip). One year took a view flight to Coldfoot and another year took a flight over Denali. In very late Feb through last Sunday in March the Annual World Ice Art Championships are going on, and the sculptures are something to see. Just throwing these out as ideas since I have no idea what time of year you will be going and if you are planning for this year or next, etc. Here is a thread from the not-to-distant past that may be helpful, even though it was posed and answered with camping in mind; Summer Camping Trip to Alaska - Advice Needed!